Have you found an online vendor selling Mocambo 20 Art Edition? I've tried a lot of aged rum in my life and I will tell you, this is the nastiest ever. dont waste your money or time. Mexico make tequila, not rum. I want to like this rum, but honestly there is nothing special about it. There are cheaper rums with more complexity to be had at a better price. Dark amber, intense colour, with hints of red. Nuts, caramel, dried fruits, chocolate and vanilla. Expressive nose, well integrated alcohol and good quality of aromas. Syrupy body with a dry minerality and a winey layer. Powerful on palate yet elegant and dry. Refined and well-balanced flavours, alcohol is not aggressive. Don't spit it as soon as you taste it, it gets better...bitter, smoky, nasty rum...but just don't expect something extraordinery.. In der Nase dominierende Holztöne mit Karamell als Begleiter. Im Gaumen bleibt das Holz dominant, gefolgt von einem alten Karamell. Im Abgang scharf mit einem süssen Karamell. Ein Mexikaner der erlebt werden will. Eher für Fortgeschrittene. Dark amber in the glass. In the nose dominant wood tones with caramel as a companion. On the palate, the wood remains dominant, followed by an old caramel. In the finish sharp with a sweet caramel. A Mexican who wants to be experienced. Rather for advanced. This is a pretty good rum from Mexico. Like most Mexican rums I've tried, this has a lot of added... 'character'. Smells and tastes of heavy oak, leather, tobacco, coffee, dark chocolate, nougat, figs, pepper, cinnamon, and brown sugar. It's got a lot going on and is quite nice. It doesn't have a traditional rum flavor, though it's a great example of what I've come to expect from Mexican rum. Definitely worth a try! 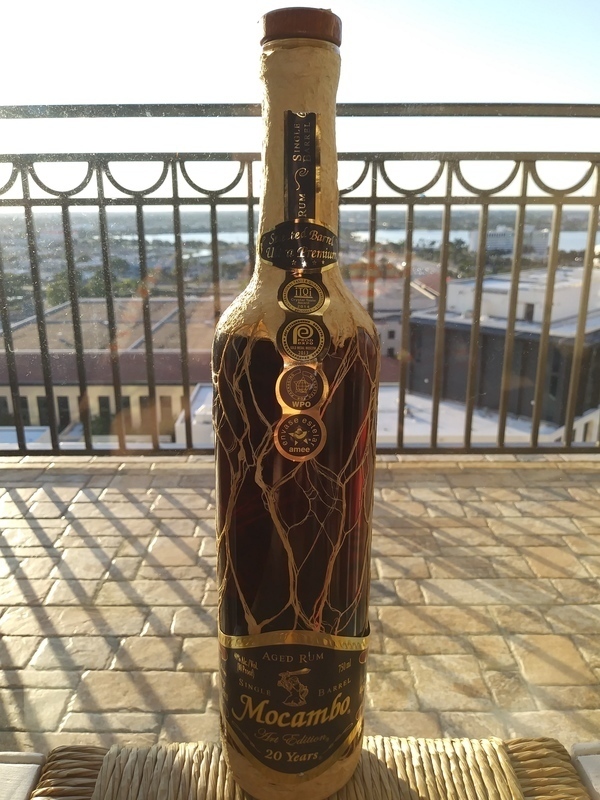 I have tasted over 700 aged rums over the past 15 years and I know the Mexicans can produce some amazing tequila's, but this supposedly 20 year rum tastes horrific, leaves a very bad afterburn and you will reek tobacco leaves and stale coffee for the rest of the day. You can't even mix this with Coke, it's that bad. The bottle looks artsy, but the liquid inside is pure rat poison. I tried Mocambo 20 years after reading the Ratings. Smooth at the beginning, dark chocolate and cinnamon on the finish. A tiny bit of pepper perhaps. very interesting. I love the bottle presentation and the fact that no two bottles are alike, similar to Wild Tiger Special Reserve rum from India. A single cask rum similar to its younger 15 year old sibling. Some bitterness and dryness coming from the leather, cigar leave, and woody taste. The taste is somewhat bitter and tastes like dried fruit. Would do well in a Cuba Libre or other mixed drinks. 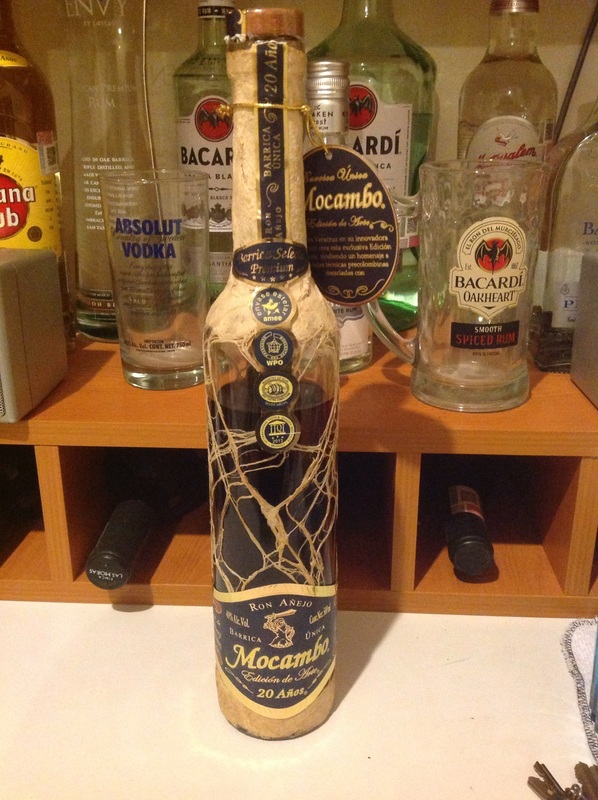 Bon rhum provenant directement du Mexique et qui réchauffe encore la gorge malgré une soirée bien arrosée. The bottle is amazing, but sadly the rum inside is not to my liking at all. I only sampled this once in a bottle shop, though. Seems more a cachaca than a rum. Nice bottle, but disappointing flavor for the price. Have it as a 4.5 on my chart. Always wary when they make a fancy bottle. Middle of the road IMO. A bit of spice at the start. This Rum is very nice smooth like a good scotch no after bite. This rum has a great aroma in the glass. Vanilla, Caramel, Wood, and raisins or perhaps Port are the predominant aromas detected. In regards to taste this rum starts off very smooth and semi sweet at first, but has a harsh aftertaste that I would compare to burnt sugar or molasses mixed with old coffee and whiskey. Great start, but a disappointing finish leading towards a heartburn. The bottle is a unique package and looks good on the shelf but that's not enough for me to buy a second bottle. but for me this rum is a mixer and not for sipping neat. Průměrný rum, který není ničím zajímavý. Není špatný, ale to je od rumu za tu cenu málo. Ron normal, nada fuera de lo normal, sabor fuerte y obscuro, lo más llamativo y bonito es su botella! At $50 CAD a bottle, it a steal. My first impression was tequila. It was only subtle, but it caught me off guard. It took some time with it... and as it turns out, I am a big fan. Was my first Mexican rum, but opened my eyes to exploring more. Beautiful dark colour and a unique flavour that I truly enjoy. Hope I can find it when I go looking again! Your initial reaction is 'look at that bottle, this has to be a great rum'. Nice dark color, long legs. Dip your nose into the glass and you will find a pleasant sweet scent of caramel/toffee and mocha... Tasting it and you will find that sweet toffee taste is very thin and the coffee taste dominates. And it's a bit artificial coffee taste. Like when something is coffee flavored but not coffee. Or a left over coffee cup with dried coffee on the bottom. To me that didn't do it. If the caramel/toffee taste would be much richer and being the dominating taste I would have felt the coffee taste would add to the experience but this doesn't work.